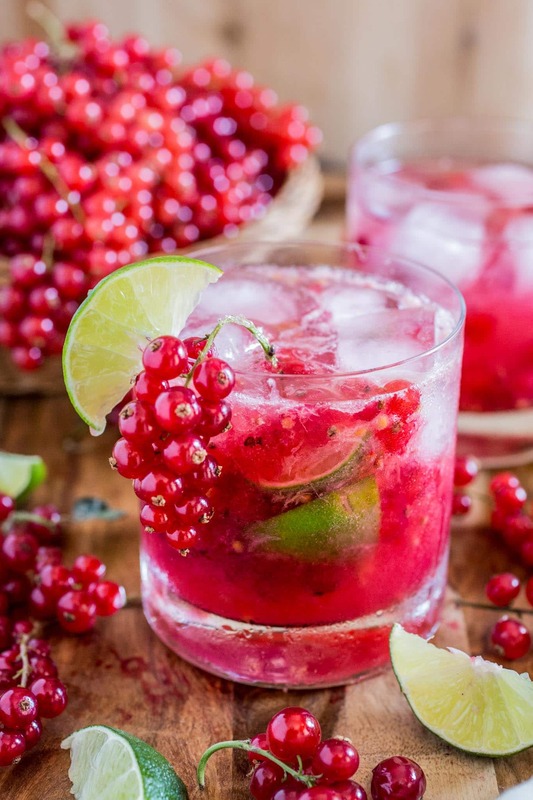 This red currant twist on a classic lime Caipirinha might be my new favorite summertime cocktail! Sour, sweet and as strong as you can take it. There’s really no better way to beat the heat! Every now and then, a product or ingredient will pique my attention and I will spend hours playing with it. This summer, it was red currants. I spent a whole day playing with the flavors, texture and colors of this whimsical little fruit. Seriously, is this real life? I get to create recipes and take pictures of pretty food for a living? I really love my life right now! But then I thought of how quickly red currant season comes and goes, and I got a little sad. So I made myself a cocktail – these beautiful Red Currant Caipirinhas – to drown my sorrows! ??? And then I went to the store to buy all the red currants I could get my hands on, because there are so many currant-licious recipes I still wanna make before the season is over. Red currants are best known for making great jams and jellies, and they are more common in Europe than in the United States. In Brazil, they are really popular among children, who can’t live without their “suco de groselha”, or red currant juice. But don’t be fooled! That is no juice but a store bought very sugary syrup, similar to Grenadine, mixed with water or milk. Delicious nonetheless! ? The fruit itself isn’t very easy to find down there, so it was only after I moved to the U.S. that I had the opportunity to try it. And because of my childhood syrup-y drink, I was expecting it to be very sweet. Imagine my surprise when I popped one in my mouth and it exploded into this magical and juicy tartness. No, red currants are not as sweet as I thought they were. They are so much better and very addicting! As pleased as I was with how the currants tasted, I was equally in love with their bright ruby color. Seriously, aren’t them incredibly stunning? Who, in their right minds, would pass something this beautiful at the grocery store without snatching a few containers? 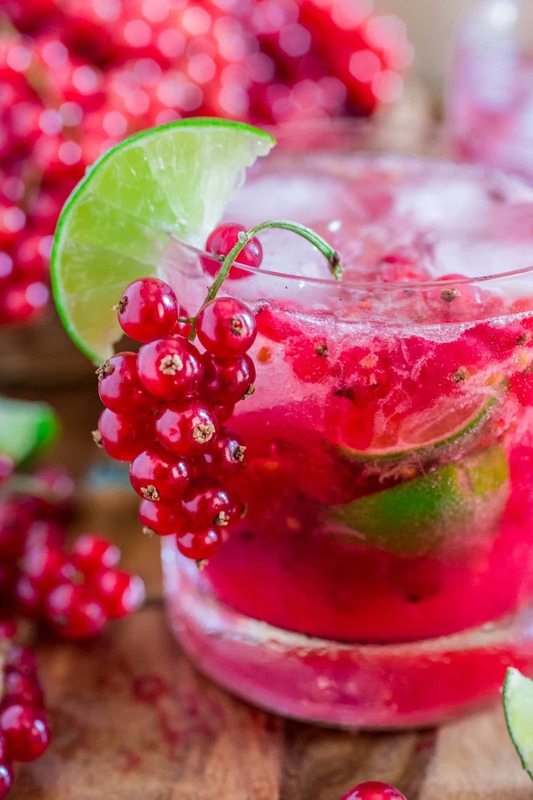 And as I stared at my many containers of red currants on my kitchen counter, trying to imagine them in cakes, mousse or even a glaze for chicken, I couldn’t help but envision them becoming a simple but special cocktail: a caipirinha. I am sure you either tried or at least heard of this famous Brazilian cocktail made with cachaça, which is a strong sugar cane distilled spirit. What some of you probably don’t know is that there are many variations of caipirinha, either with different fruits other than the traditional lime, or with different types of alcohol, like vodka or sake. 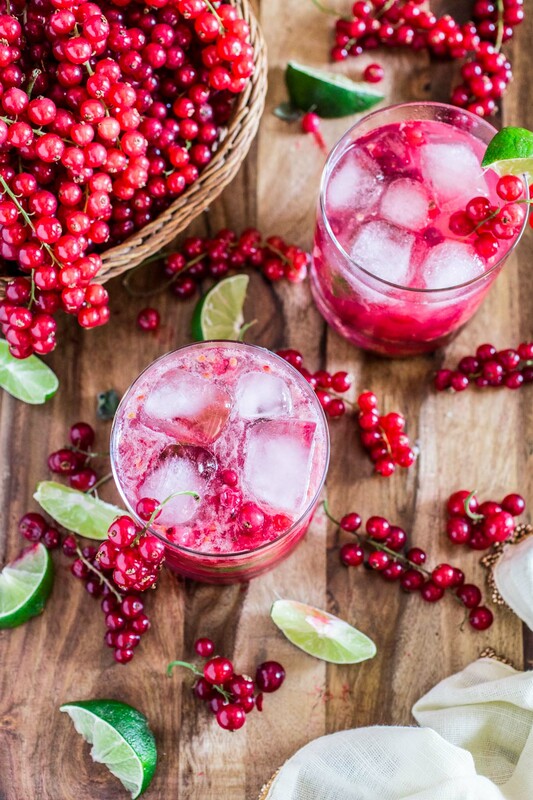 In this version, I decided to combine the currants with lime for a sweet-tangy-citrusy super delicious cocktail that will keep you fully refreshed! 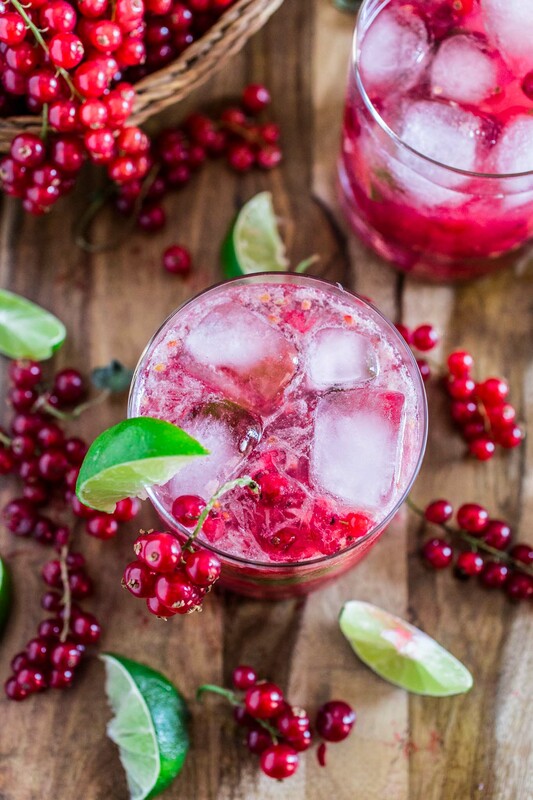 If cachaça is not your thing, you can make this red currant cocktail with vodka or sake instead. 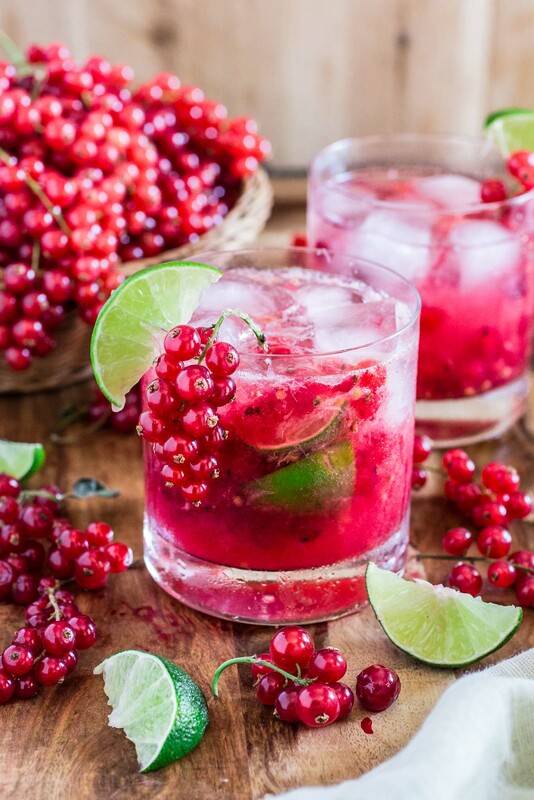 Their names would then be Red Currant Caipiroska (with vodka) or Red Currant Sakerinha (with sake). Not that it matters, really, but I thought it would be fun to tell you the right terms. ? Truth be told, I prefer a caipiroska or a sakerinha over a caipirinha. The cachaça is just too strong for me. I guess I’m a lightweight like that! Whatever you choose to make your cocktail with, I really hope you make it while currants are in season. 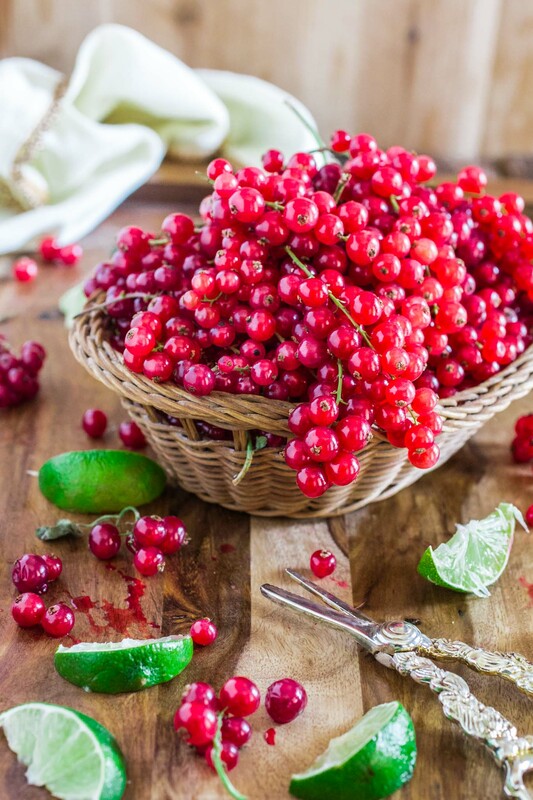 For more red currant inspiration, visit http://hbfberries.com. Remove the red currants from their stems, using a fork to gently tug them downward into a bowl. Reserve a few to garnish. Cut the lime into 8 wedges. Muddle the wedges with the red currants and sugar in a cocktail shaker. Add cachaça (or vodka) and ice, and shake for a few seconds. Transfer to a rocks glass and serve. Sadly I don’t see red currants anywhere out here so you’re one lucky lady. I only ever see them dried. Now, the photos here are STUNNING. Just beautiful. Now I’m thirsty, too. Look what you did Olivia! Thanks, dear! Just come visit and we’ll have some caipirinhas. This is so pretty Olivia, gorgeous pictures my friend! These are absolutely stunning! I’ve never even bought currants before (I’m not sure I can even find them here at my grocery store) but I will be on the lookout now. Seriously gorgeous photography! Your pictures are absolutely stunning. I love currents…dried and in jam. This sounds delicious…and I happen to like vodka too. Absolutely GORGEOUS! Love the pictures and the caipirinha looks so refreshing and light. Your pictures are making me so thirsty!! This drink is positively beautiful :) So perfect for summer!! Wow, this drink looks so colourful and refreshing! Going to be sharing this one all over. This is drink art!! !